For our last CD "Atlanta Loves Elvis" we selected one of the best Shows from his last Tour in 1976 and for our new CD we will stay in the same Year. This time we decided to take a show from Johnson City from his first Tour in 1976. 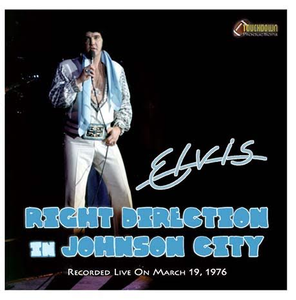 With "Right Direction In Johnson City" we present you his show from the 19th of March 1976. Again it`s an Audience Recording and the quality is really good for this kind of recordings. With no doubt this show is the best from his first Tour that year and for sure also one of the best of the whole year. The performance of Elvis is on the same level as the one from his last tour and the Set list is excellent. The CD has a duration of 79 Minutes and four seconds. Total Playing Time: 79.04 min.